Rajastan is a fashion designer’s dream world. 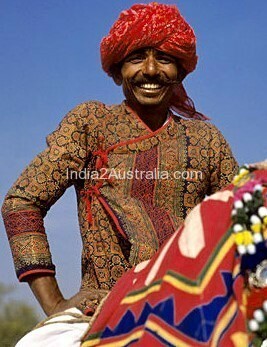 The colourful vitality of Rajastani costumes has no parallel anywhere in the world. The women in Rajastan wear a combination of upper garment, the puthia or kanchli and a kurti, and a lower garment the ghaghra or skirt and a veil which is known as odhna , draped across upper and lower parts of the body. There are many variations to this depending on the tribe, community, social status or marital status. But these three items of dress comprise the essential costume worn by woman in Rajastan. 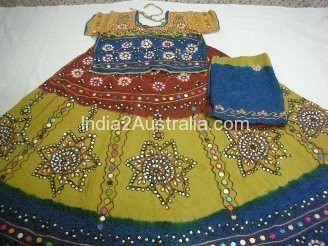 Puthia is usually worn by young unmarried girls and elderly woman. Puthia is discarded only after a woman attains puberty. Puthia is a double breasted garment with upper flap crossing over the right side of and tied with a cord under the left armpit. The entire length of the garment is constructed from a single piece of fabric. The puthia is constructed of two front panels, one front extention, one back piece, two sleeves, four side panels and two gussets. The neck is deep shaped like a horseshoe, with its widest portion over the chest. The colour of the puthia indicates the community and social status of the wearer. Kanchli is the traditional upper garment worn by married woman in Rajastan. A girl changes to Kanchli from puthia after she gets married. The kanchli usually has a sweetheart neckline with three or five points. Most kanchli usually have a deep revealing neckline. The length of the sleeve varies depending on the ethnic group. The cords attached both sides at the back allow for minor changes in body proportions. As the kanchli is revealing it is worn either with an odhana (veil) that drapes across the front. It is an upper garment worn with Kanchli. Kanchli is a revealing upper garment. To make the costume modest , kurti is worn above kanchli. In Rajastan only married woman are required by tradition to wear kurti. Kurti is usually a sleeveless garment with a deep horseshoe shaped neckline. Since the neck is large, most of the kanchli worn underneath is exposed. The design of the kurti varies between the communities. The skirt in India is known by many names and Ghanghra is one such name. Ghangra is normally worn with kanchli and odhana. Sometimes a patka or phetiya is worn as centre piece over the ghaghra to control its volume and fabric. Ganghra isa long skich which has the construction of a simple gathered skirt or a flared gored skirt. It covers the legs fully or partially. 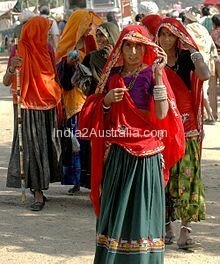 It is the veil that Rajastan woman wear. It is a rectangular cloth of around 2metres wide and 4 metres long. Woman in Rajastan drape Odhana in varying styles. Among the odhna chunri is the most commonly used. This is a tie- dyed odhni for the married woman, usually red in colour, with designs like birds, flowers and leaves that are set in white. 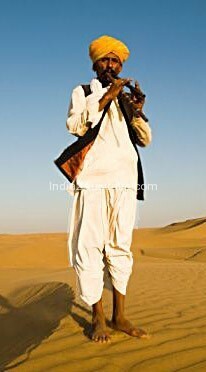 The two traditional garments worn by men in Rajastan are bandi and angarkhi. But today kurta is is considered traditional wear and takes precedence over all other garments. Among aristocracy garments like jamma, achkan , shervani and choga are also worn. Bandi usually worn as an innergarment under kurta. But among working men from Kamhar ( potter – community ) community wear It as an upper garment. Bandi usually have a round neck but it may vary depending on the community. On festive occasions Kamhars wear Bandi with five silver buttons linked with chain. Often this garment has no opening and reaches till the waist. Kurta is an upper garment with a round neck and side pockets. The sleeves are usually full length. The centre front opening has a placket with buttons. The Angarkha forms the part of traditional male ensemble and is worn by almost all communities in in Rajastan. While angharkha is the longer version, the shorter version angharkhi is shorter cut in similar style. Angharkha is a formal wear of affluence. For day to day use the shorter version angharkhi is worn. 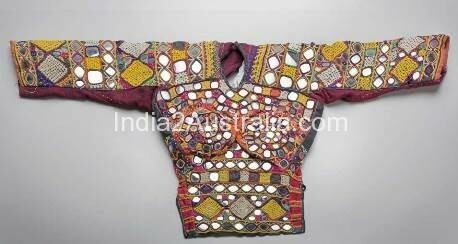 It is round edges with a trianglualr opening at the front and the inner panel known as the parda which covers the chest and si visible through the cut out portion of the yoke. To enhance mobility slits are usually made at the sides and also at the wrists. The angarkha is usually fastened at the neck , underarm , chest and waist with fabric ties or cords. Choga is a long sleeved rob that fits loosly around the bodice and doesnot have a noticeably tailored look Traditionally choga has a deep oval or heart shaped neckline. A pair of loops and cloth cased button fastens at the chest. It is worn as an outer garment over kurta or angarkha and is generally made of fine woven wool, though fine cotton is also used. Achkan is a full sleeved tunic with high round neck. This garment has a length which falls about 3-5cm above the knee. It has full front opening in the centre and is fastned with buttons and button holes. It is worn among all communities in Rajastan in combination with churidar, especially on formal occasions. Another garment of similar construction is shervani. This is worn mostly on weddings. The shervani differs from Achkan in length and flare. It is longer and falls 3-5 cm below the knee and has a wider flare. It is the lower garment of Rajastani men. It is an unstitched cloth draped in trouser like form, and is extremely suitable for tropical climate. Rajastanis drape dhothi at the waste with elaborate pleating in the front and back. The difference in draping modes arise from social status and occupation of the wearer. It is headgear worn by Rajastan men. 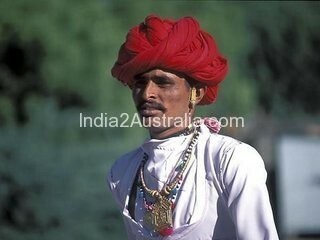 In Rajastan turbans have many names and they are pagadi, pag, potia, mandil or shamla . The style of tying the turban , the colour , the design, material are dictated by the occupation , community, region, economic and social status of the wearer. The turban is usually made of a fine muslin like fabric . Cotton is the most preferred fabric. The length of the turban is usually 8-9 metres extending to 18 metres in some cases. Juti is the footwear worn in Rajastan unique to this region. 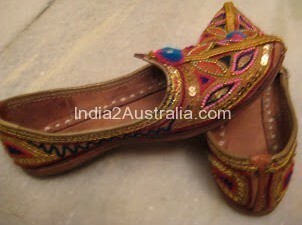 Juti , mojari or pagarkhi are leather shoes worn by both men and women of all communities. It is mostly triangular at the front. The people of moti community have practised the traditional craft of making the juti and for centuries and continue to do so even today.